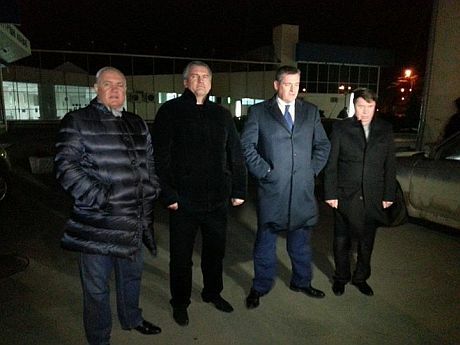 Russian MPs arrived in Crimea. They announced that the Russian Federation is considering the simplification of rules for obtaining Russian citizenship for people in Crimea, especially if Ukrainian opposition does not follow the agreements signed with President Yanukovych. They also noted that Russian Federation will quickly respond if there will be calls from Crimean people to make Crimea a part of Russian Federation. The source compares this situation to the similar one that occurred in 2000 when Russian Federation simplified citizenship procedures for citizens of Abkhazia and South Ossetia. This later was used during the armed conflict between Georgia and Russian Federation as a justification for an armed invasion of the Russian army in Georgia. Yet, the Russian parliament refutes these claims, asserting that this topic has not yet been discussed and examined. However, the parliament’s speaker states that Russian Federation will not leave Russian-speaking Ukrainians unprotected and will act if their rights are limited by the new government. “If Ukraine quickly elects a new government and organizes outreach in Crimea, it would be able to preserve territorial integrity” said the former Georgian President Saakashvili Myheyil in a commentary on Channel 5. “The bad news is that Putin will attempt to do something in Crimea. The good news is that you already know what he will do there. He first tried it here, in South Ossetia and Abkhazia,” – he said. He said that as the first step, Russia will grant citizenship to the Crimean people and then will try to arrange a provocation and will use its fleet. “He will attempt to use its fleet to cover the isthmus that connects the region with continental Ukraine,” – Saakashvili suggested. He also said that Putin has a “crazy plan” to create a conflict arc from the occupied Georgian territories via Crimea to Moldova and Transnistria.